October to November may have been the fastest month of my life. 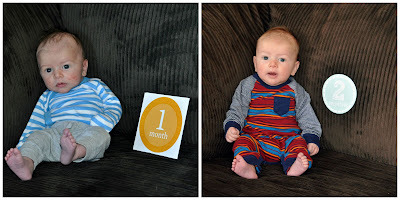 I swear I was just plucking out Wyatt's 1 Month post... and yet, here we are. 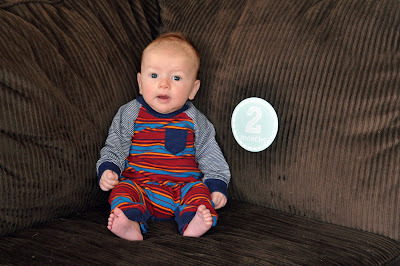 My baby boy is two months old! He weighed in at 9 pounds 5 ounces at our lactation consultation on Friday. Internally, I was proud of his weight and growth but the consultant said "he's still a little behind." I wanted to reply with "story of my motherhood life," but instead I laughed and said that all my kids grow on their own little curve and as long as they're growing (even if at a snail's pace compared to everyone else...) that's all that matters. We were having a moment of good eye contact and smiles this afternoon and I felt like my heart was literally swelling. And of course, I got all emotional and choked up for a minute because I just love this little guy so much and know that time is just going to keep flying by and breaking my heart.